Kenzo has launched Flower By Kenzo Eau de Vie, a new flanker to 2000's Flower fragrance for women. The notes for the floral fragrance include ginger, neroli, bergamot, petitgrain, orange blossom, rose, tonka bean, benzoin, vanilla and white musk. Kenzo Flower By Kenzo Eau de Vie is available in 30, 50 and 100 ml Eau de Parfum Légère. 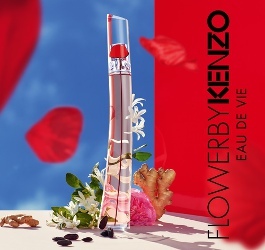 The first few flankers for Kenzo Flower were so good – in particular, Flower Oriental which played up the incense, downplayed the rose and added pepper – it has a meditative quality. But all the flankers now just get fresher and fresher. Agree — wish they’d bring back Flower Oriental. Thank goodness I never got into this brand. I would never be able to tell the bottles apart. Which I now realize is true of most brands, but for some reason it continues to surprise me that all their scents come in what seems to be the same tall, prettily but awkwardly curving bottle. It is crazy how long they’ve been doing flankers to Flower…but yeah, you could say the same of CK1, and Angel, and a few others.